Brazilian wildcard Bruno Santos has defeated local wildcard Manoa Drollet (PYF) to win the Billabong Pro Tahiti and become the first Brazilian to win an ASP World Tour event in five years. Santos, who earned his spot in the Billabong Pro Tahiti with a runner-up finish in the Air Tahiti Nui VonZipper Trials held prior to the main event, got the better of local Teahupoo specialist Drollet in their low scoring affair. Santos beat Drollet 9.16 to 6.83 on a borrowed surfboard in inconsistent three-foot (one metre) waves. Santos defeated last year's World No. 1 Mick Fanning (AUS), World No. 2 Taj Burrow and 2001 ASP World Champion C.J. Hobgood (USA), among others, en route to his victory over Drollet. 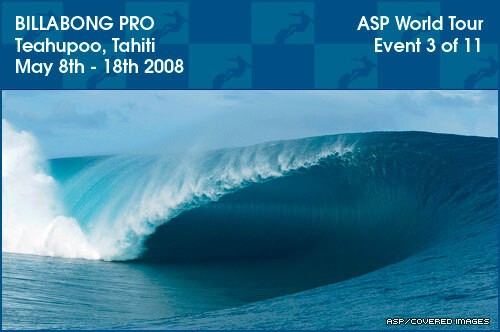 Monday, May 121, 2008: TEAHUPOO, Tahiti The Billabong Pro Tahiti is off again today due to lack of swell. Contest Director, Luke Egan is call for a 7AM start tomorrow morning swell or not. Monday 28th April 2008: Teahupoo, Tahiti HAWAIIAN hot-shot Jamie O’Brien, 24, has added another prestigious title to his list of achievements by winning the Air Tahiti Nui – Von Zipper Trials in heaving 6-8ft slabs at Teahupoo in Tahiti.